A special board meeting at Portland State University has been scheduled for next Thursday, March 7 after consultants hired by the university released a report Friday recommending keeping armed officers at PSU even as it presented a new survey showing a slim majority on campus were opposed. A new 70 rental-unit affordable housing development in the heart Portland’s historic African American community began construction Friday, marking continued progress on a longtime housing provider’s effort to mitigate and reverse displacement of primarily the black community, indigenous populations, and other long-term and low-income residents, in partnership with the city of Portland. 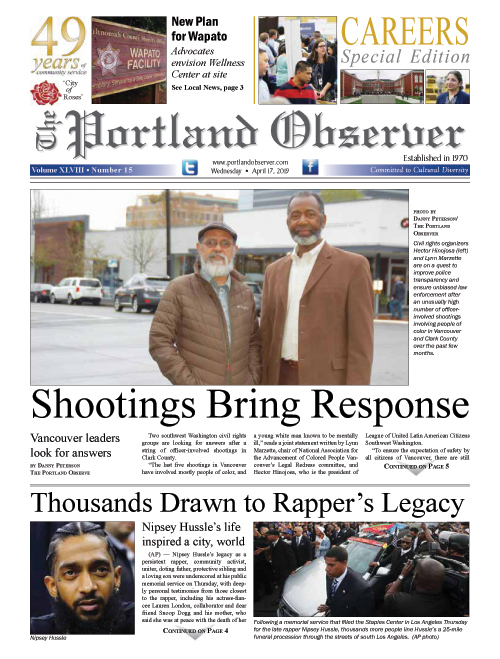 A revelation that hundreds of text messages were exchanged between a Portland police lieutenant in charge of overseeing protests and the leader of a far-right group has spurred outrage from the mayor and other community members. Now, the mayor will allow an independent investigation of the Portland Police Bureau to look for any wrongdoing and call for added police training to help them identify white supremacist groups. An often overlooked aspect of the story of Rosa Parks, the civil rights icon whose refusal to move from her seat for a white passenger during the segregated south in the mid-1950s and subsequent arrest helped spark the modern civil rights movement, is that Parks’ choice that day was part of a planned, intentional act of demonstration against the racist Jim Crow laws of Montgomery, Ala., her hometown at the time. Ameya Okamoto is only 18-years-old but she has already has made a name for herself by creating dramatic social-justice themed artwork. KairosPDX, the public charter school that focuses on closing the achievement gap for its majority-black students, has signed a new, longer lease from Portland Public Schools that leaders of the school say will give them more stability. The Portland NAACP has new allies in opposition to a recent city policy requiring owners of unreinforced masonry buildings to post warnings signs on structures deemed to be at risk of collapse during an earthquake. A northeast Portland church that is scheduled to host this year’s annual Martin Luther King Jr. tribute was struck by a vehicle over the weekend, but the damage was not expected to impact the Monday, Jan. 21 celebration. Burgerville employee James Curry is on the front lines of a successful fight for workers rights and livable wages and he expects more victories in the New Year. Portland made history when workers at three area Burgerville restaurants voted last year for collective bargaining rights, the first fast food restaurant chain in the nation to have unionized employees. A northeast Portland coffee shop is on guard after the fourth break-in in less than a month and surveillance video may lead to the person responsible. Small permanent memorials were placed atop street signs in a southeast Portland neighborhood to honor Ethiopian immigrant Mulugeta Seraw on the 30th anniversary of his death when white supremacists attacked and killed him with a baseball bat because he was black. Affordable housing advocates are celebrating the opening of The Beatrice Morrow apartments, an African American- led housing complex that is the first to open under a preference policy for displaced residents. Portland Mayor Ted Wheeler will bring a proposed emergency ordinance to the City Council on Thursday asking the city to restrict when and where protest groups with a history of violence may gather and demonstrate, saying tougher regulations are needed to curb injuries to people, damage to public property and offset other safety concerns. Service, teamwork, and career opportunities are what are in store for people who join the Army. That’s the message from Sgt. Maj. Tabitha Gavia, the first female senior enlisted leader in U.S. Army Recruiting Command history. Just a week out from the Tuesday, Nov. 6 General Election and Oregon is poised to see a larger than normal turnout, boosted in part by a bigger interest in the Midterm elections nationally but also in a local race for a coveted Portland City Council seat that will make history by ushering in Portland’s first black female councilwoman—the contest between former NAACP President and State Rep. Jo Ann Hardesty and current Multnomah County Commissioner Loretta Smith.